“Though a woman, I seemed a warrior, I threw the weapon; though filled with fear, I learned to conceal my weakness.” Margaret defended the besieged city of Jerusalem during the Third Crusade, before being enslaved. Ultimately she made it back to Europe and became reunited with her brother. Read her story here. 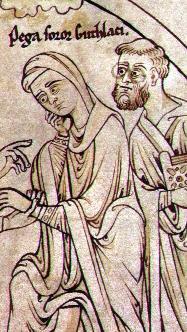 Another brother and sister Pair: Guthlac’s Sister, Pega, and Guthlac. Detail of Harleian Guthlac Roll Y.6 Image.